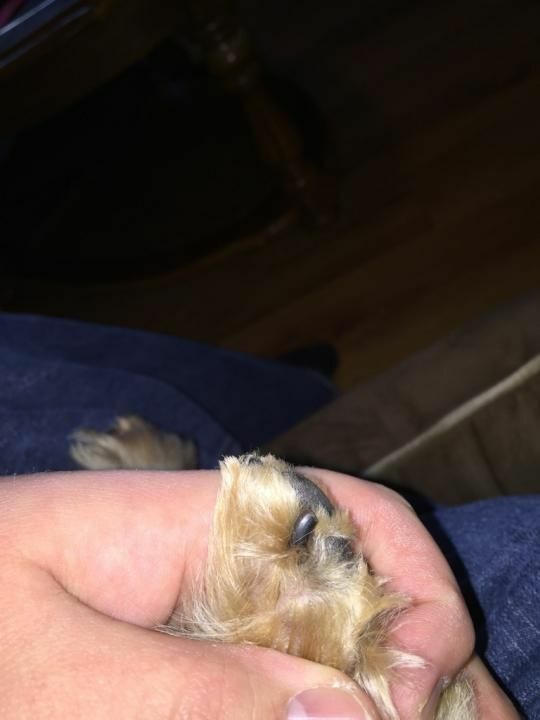 As soon as a lifted her back paw to check it I noticed the nail. It doesn't seem to be causing her much in the way of pain , however there is definitely discomfort when I try and manipulate it. (If she was in a lot of pain I wouldn't be able to touch it without her freaking out entirely). I soaked in cold salt water to reduce swelling, sprayed her nail and surrounding area with colloidal silver then applied polysporin and dosed her orally with colloidal silver (1 tsp each dose) first dose last night second dose about 45 mins ago. The nail doesn't look any different since last night but she's acting normal again today and she hasn't had any issues walking at all. Should I bring her to the vet now and pay a fortune for e-vet or is this something that I could make an appt for? I'm watching it closely but I'm still nervous. It's hard to tell with the hair whether the toe itself is swollen, don't think you mentioned? One of my cats had what we presume was some sort of nailbed infection, and the toenail was thicker, and discolored (yellow/brownish rather than clear), but her toe was also swollen and red/peeling around the nail. It took about 6-8 weeks of antibiotics to clear completely. Had it not resolved, vet recommended a declaw/toe amputation, but I wanted to try the antibiotics first and luckily it started to look better after a couple weeks. Her toe didn't seem to bother her much, and I didn't do anything topically to treat because I was afraid if it was moist, litter/debris would be more likely to cling. She has chronic allergies/granuloma problems, so I think she just has a poor immune system. 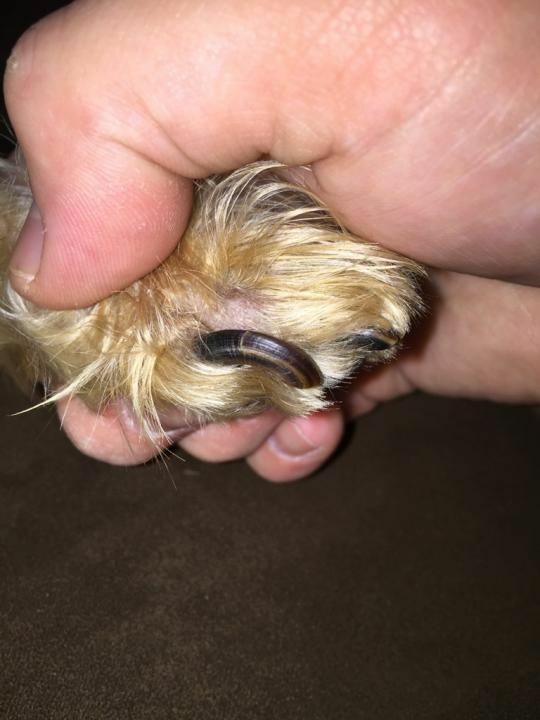 Have seen a few dogs which have had thickened/deformed nails, and some of them are due to injury or infection, but I think the general rule is that if there's swelling of the toe/nail that doesn't resolve with antibiotics is to biopsy to be sure there's no malignancy. My own super old dog used to have nice short triangular shaped nails, but now because she gets minimal exercise and maybe I guess just due to old age/less than optimal health her nails are much thicker and softer/more brittle/dry feeling. It's all of her nails pretty much, and they otherwise seem ok, so I don't worry about them, but if there was only one, I'd be curious. Another possibility if the nail checks out as healthy is that maybe it is just not getting appropriate contact with the ground to wear even with the other nails. Maybe there's something going on with her gait that's changed recently. If that's the case, I would work the nail back to an appropriate length/shape and see if it reverts back to the deformed state with normal use. Sometimes wear and tear on nails can change their characteristics too. My dog Bus digs a lot in sand/rocky clay, and his front nails are thicker/harder than his rear nails (he's also the only dog I know who needs his back nails cut more often than his front!). It looks like it's had the same sort of growth for a little while, so I wouldn't think it's an emergency to have her seen right away if all else appears ok. If there's any redness or swelling of the toe itself or it seems painful I would be more concerned, but otherwise I'd be ok with waiting a few days to see the regular vet. TBH I would just cut the darn nail as it's not just a little overgrown and see if cutting it resolves any soreness in the toe over the week. I suspect this is just soreness caused by a really long nail. I once missed a nail apparently repeatedly on one of mine. I noticed Holy crap that nail is long just as she jumped on my lap and promptly ripped it out down to the nail bed. So yeah - it happens. Live and learn. I totally agree. Give it a good clip and a few days to heal. There's a good chance that nail got caught on something and that's why it's tender. I think you'll notice an improvement just a day or two after clipping it. It's been a few days since you posted. Did you clip it? How is she? Yup! Just cut that sucker as close to the quick as you can get it. It might be irritation from the nail being long enough to cause pressure when she's walking. Try that and if that doesn't help in a day or so, then make the appointment.